“What you see is not true and what is true is not seen.” Violence and war in fiction can rarely match up to the sordid, devious reality of it. We cannot dream of the depths to which we humans can fall. This is what makes Lesleyanne Ryan‘s book Braco a truly compelling read. Although a fictional account, it is based on facts, and on the author’s own experiences as a peacekeeper in Bosnia during six months of the Balkans conflict in 1993/4. I’m not surprised that Lesleyanne’s Braco, winner of the Fresh Fish Award for Emerging Writers 2011, has now been shortlisted for the Margaret and John Savage First Book Award as well. It is a powerful book written in almost journalistic style from six points of view: a Bosnian boy, Atif, who struggles after the fall of Srebrenica to escape through the woods to safety, and five people who touch his life – Marija, his mother; Tarak, a Bosnian soldier; Nico, a Serbian soldier; Jac, a Dutch peacekeeper; and Mike, a journalist. I can promise you this: if once you pick up this book, you will not be able to tear yourself away until you have finished it. And it’s one of those books that will haunt you long after you have put it down, because you know that the events described actually happened. In July 1995, over 8,000 Bosnian Muslim men and boys in and around Srebrenica were massacred by units of the Serb Army. As of July 2012, 6,838 genocide victims had been identified through DNA analysis of remains recovered from mass graves. This grim statistic does not take into account the true horror of the Balkans conflict. The killings had begun years before, hundreds of villages destroyed and over 70,000 people displaced in a campaign of “ethnic cleansing”. Lesleyanne in a town in central Bosnia, 1994. After reading the book, I had a lot of questions for Lesleyanne, and I’m lucky to have her here on my blog today to answer them and share some of her photos. Q. What does Braco mean and why did you pick that title? A. Braco is the Bosnian word for Little Brother. It wasn’t my original title. I had “The Road to Tuzla” and “Walk Away From the Moon” as working titles at one point or another. I came across the word Braco when I was looking for a word in the local language that might be used casually when referring to a younger boy. I asked online and got a response from a Serbian who gave me the word. I started using it in the manuscript and while work-shopping a chapter with Paul Butler, he suggested it would make a great title. Sarajevo, 1994. Next to a sea container where someone has written “watch yourself sniper”. Q. If you were to pick one POV in the book that is YOUR POV, which would it be and why? A. Jac the Dutch peacekeeper because I could so easily have been in his boots in reality. 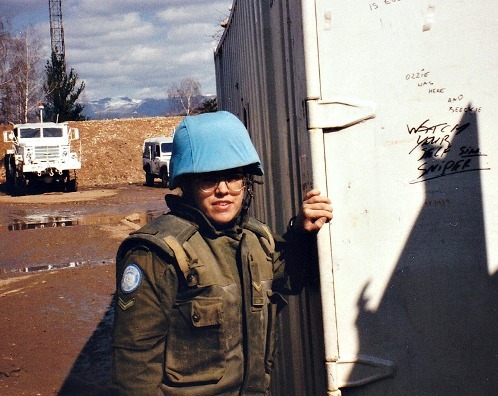 And having served in Bosnia, I understood the mindset of the peacekeeper, and more importantly, the frustration of the peacekeeper in Bosnia where we were expected to do the traditional job of a peacekeeper in a land where there was no peace to keep. Q. What was the hardest part about writing this book? A. Probably the one thing that I found hard throughout the whole process of writing it was wondering if I was the one to write it. I can’t count how many times I wondered why a woman in Newfoundland had any business writing about these events in a country so far away. But every time I met a Canadian or American who had never heard of Srebrenica, I knew I was doing the right thing because I wanted them to know what happened. Q. How did you maintain 6 distinct voices in your book? A. Flowchart! When I was ready to sit down and write the first draft, I had a fair idea what I wanted to do, but I needed something on paper. I ended up buying poster-sized plain paper and flowcharting every single chapter. For each chapter, I had listed the content and assigned the voice and indicated where characters crossed paths or where one voice would lead to another in the next chapter. Then I sat down in July 2008 and in three weeks, wrote the first draft following that chart. Children at the Visoko hotel, Bosnia, 1994. Q. Good guys, bad guys, the lines blur in your book as they do in reality. But we all know what happened after the fall of Srebrenica. How did you keep your own feelings out of Braco? Q. In Michelle’s blog post you mention that with this book you wanted to “stain the silence, that we not forget this or the blood of the eight thousand…” and to remind people of the genocide. I agree with you hundred percent. But how do you square that with the need for and attempts at reconciliation today, including the Serbian president’s recent apology? A. Excellent point. I guess I think of all this in terms of a North American audience since they are my reader right now and the European audience has some knowledge of what happened. They haven’t been as silent as we have. If anything, the Serbian apology is an indication that Europe’s refusal to be silent on the subject has worked. It took many years for the Serbian people to even believe that the massacre had occurred. If the Europe community had chosen to remain silent, there would have been no reconciliation, no apology, no admission that what happened was wrong. The ultimate hope is that this helps all sides learn from the past and move on to a more peaceful future. Amen to that. Thanks Lesleyanne, for answering my questions. I know you had to wring yourself out to write this book. As a reader, I can only be grateful that you succeeded. Click Here to read an excerpt from Braco. This entry was posted in Books and media, Writing and tagged Balkans conflict, Bosnia, Bosniak, Braco, Fall of Srebrenica, Lesleyanne Ryan, President of Serbia, Serb, Srebrenica, Srebrenica massacre, Yugoslav Wars. Bookmark the permalink. Terrific interview Rati! No, I’m not at all surprised by Lesleyanne’s literary awards and accolades either. Great photos of LA’s tour of duty – lovely touch. Great piece. I would like to read this book. This was one conflict where India did not have any peacekeepers from the Army. However, we did have Lt Gen Nambiar as the overall peacekeeping force commander for one year. He was a personal pick of the then UN Secretary General, Koffi Annan.